Flower beds are the best way to welcome spring and summer. Planning a space for all of your favorite perennials, annuals and seeds is just as important as planting. As many gardeners know, it’s hard to stop at a just a few colorful favorites. There is no such thing as too many plants in the garden of a flower lover. Designing a large flower bed will allow you to enjoy a variety of flowering plants in one location. Large flower beds are generally considered those over 6 feet in diameter. Choose a location where you would like to plant your flower bed. This should be an area that receives at least six hours of sun a day for a partial shade garden or more than six hours of sunlight a day for a full sun garden. Shade flower beds flourish in areas that are protected from the sun by your home, shed or shade trees. 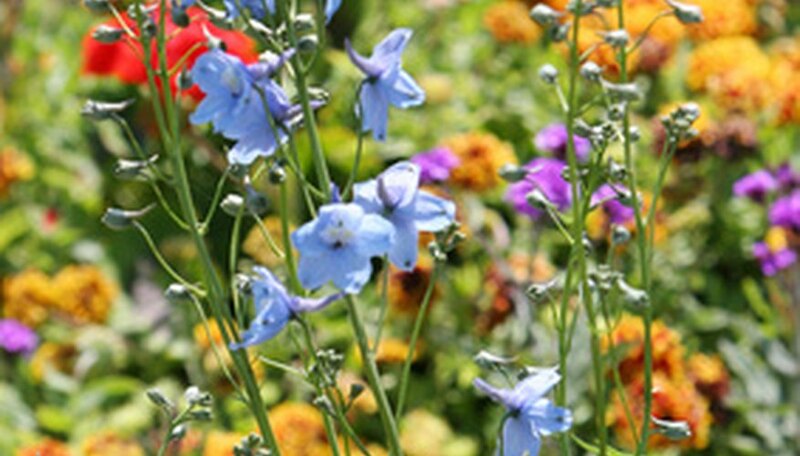 Select a border for your flower bed. Popular choices include bricks, stones, logs or garden edging. Measure the area where the flower bed will be. Make sure there is enough room for tall plants to thrive and low-lying plants to receive adequate sunlight. Take into consideration if you are placing a border around the bed or if it will be raised. This will make the bed a few inches smaller than the perimeter measurements alone. Take into consideration the size that any additional garden elements such as fountains or solar lights will take up. Research how large your flowers will get. This information can be found on the plant marker that came with the plant or on the back of the seed packet. This is important in the outcome of your garden so no plants get smothered or buried behind towering ones. Make sure you also note in your journal how far apart each plant is to be spaced when it is planted into the ground. See the plant spacing calculator at landmarknursery.com for reference. Set up on paper where the plants will be within the bed before the planting takes place. Use your journal to plan and keep track of where your plants will go. Keep hardy tall perennials and annuals that need the most sun in the back. Low-lying flowers can fill in the middle and front. Keep in mind that some of the taller plants may shade the other plants as they grow larger throughout the summer. For new gardens and new plants, keep in mind many perennials multiply each season. Many will have to be propagated or cut back as they mature. Some perennials take as long as five years to reach their maximum growth and height. Use recycled items, such as rocks, bricks and rubber elements, in your flower bed. Rubber can be turned into mulch to use to keep weeds at bay.